2Profesor de Medicina, Unidad de Gastroenterología, Universidad Nacional de Colombia, Hospital Universitario Nacional de Colombia. Bogotá D. C., Colombia. 3Internista oncólogo, Instituto Nacional de Cancerología, Universidad El Bosque, Centro Nacional de Oncología. Bogotá D. C., Colombia. Metastatic tumors do not always have obvious origins: in one third of these cases, the primary tumor is never found. This article is a guide to the most recent advances in diagnostic approaches and patient management of these fatal and frequent tumors. An additional objective of this article is to help avoid common and serious errors. One of the most important errors is not taking the fundamental role of histological confirmation into account since it can avoid unnecessary investigations. The article also details the components of a standard evaluation, classification according to prognosis and indications for a secondary evaluation. These include indications for upper and lower endoscopy, tumor markers, positron emission tomography, and the roles of genetic profiling, epigenetics and viral DNA. It also indicates the moment at which an investigation should be stopped. Recently, treatment has changed, and these changes seems to have changed the history of these patients and their counterparts with known primary tumors. 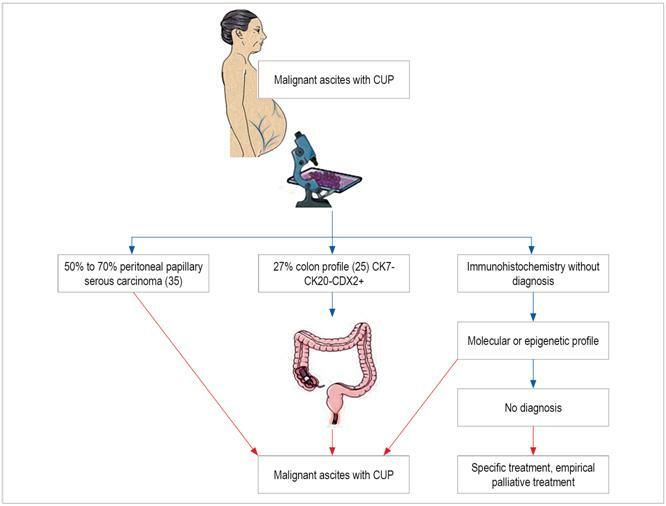 Taking into account the importance of this topic in daily clinical practice, especially in gastroenterology, we decided to perform the following review to guide clinicians in their approach and management of patients with this type of oncological presentation. Search terms were based on combinations of “cancer of unknown primary”; “neoplasms” and “unknown primary” [MeSH] with each point of interest the terms “MeSH” and “not MeSH” in Spanish and English. The search strategies used were “neoplasms, unknown primary AND epigenetic”: “neoplasms, unknown primary AND immunohistochemical diagnosis”; “neoplasms unknown primary AND molecular diagnosis”; “neoplasms, unknown primary AND colonoscopy”; “neoplasms, unknown primary AND diagnosis”; “neoplasms, unknown primary AND endoscopy”; and “neoplasms, unknown primary AND treatment”. We searched the scientific literature in the Pubmed, Embase, Cochrane, Science Direct and Lilacs databases. The limits used were Spanish or English, human species and publication date 2012 to 2017. Articles corresponding to clinical practice guidelines, observational studies, controlled and randomized clinical trials, reviews, systematic reviews and metaanalyses were included. Of these, those that the authors considered pertinent were selected. In addition, some of the articles mentioned in the references of the publications selected in the initial search were added to the review by the authors. The biological events that allow a primary tumor to remain hidden after the development of metastases have yet to be defined. 16 Even after an autopsy, the primary tumor may not be detected. For these cases, various theories have been proposed including regression or involution of the primary and development of the CUP in stem cells with capacity to differentiate into multiple cell lines to the liver, muscles, skin or even the cells of the gastrointestinal tract. They may be located in the connective tissue after birth. 7 There is no evidence that CUP is a different biological entity with exclusive genetic or phenotypic characteristics that differentiate it from other tumors. Various studies have shown chromosomal abnormalities, aneuploidies, and overexpression of several genes that are not specific to CUPs and which, to the contrary, occur in other malignancies. 10,16,20 The mutations and genetic alterations found have been divided into 6 groups (Table 1). BCL2: B-cell CLL/lymphoma 2; C-kit: tyrosine-protein kinase receptor; CD34: cluster of differentiation 34; c-Met: hepatocyte growth factor receptor protein; EGFR: epidermal growth factor receptor; EMT: epithelial-mesenchymal transition (EMT); HER2: human epidermal growth factor receptor 2; HIF1α: hypoxia-inducible factor 1-alpha; KRAS: Kirsten rat sarcoma 2 viral oncogene homolog; MMP: matrix metalloproteinases; Notch 3: Neurogenic locus notch homolog protein 3; p21CIP1: cyclin-dependent kinase inhibitor 1A; p53: tumor suppressor protein p53; PKB/Akt: phosphorylated protein kinase B; PDGFR: platelet-derived growth factor receptor; pMAPK: phosphorylated mitogen-activated protein kinase; pRPS6: plastid ribosomal protein S6; PTEN: phosphatidylinositol-3,4,5-trisphosphate 3-phosphatase; TIMP: tissue inhibitor of metalloproteinases; THBS1: thrombospondin 1; VEGF: vascular endothelial growth factor. Modified from: Pavlidis N et al. J Adv Res. 2015; 6 3: 375-82. CUP is divided into two groups according to prognosis: favorable (20% ​​of cases) and unfavorable (80% of cases). 2 Average survival time of patients in the favorable group is 12 to 36 months but is only 6 to 7 months for the unfavorable group. 19) Patients in the unfavorable group usually receive empirical chemotherapy with palliative intent, but they still have poor prognoses. Favorable subgroups are the most important, and all efforts are directed toward them. Identification of the subgroup is necessary for treatment specific to the type of cancer which improves prognosis. Some patients may survive for the long-term and even have the possibility of a cure. (25- 33). Metastatic adenocarcinoma in the liver or other organs. Multiple brain metastases with adenocarcinoma or squamous cell differentiation. Multiple pleural or pulmonary metastases with differentiation of adenocarcinoma. When the group of treating specialists has not made the correct assessment of the patient or when there is a possibility of additional investigation, the provisional diagnosis should be CUP. 13 If the patient has not been evaluated before, s/he must be referred to the oncology department. Indications for diagnostic studies are described below. Carbohydrate antigens (CA) 125 and 15-3 should be interpreted with caution given their limited specificity.2,13. 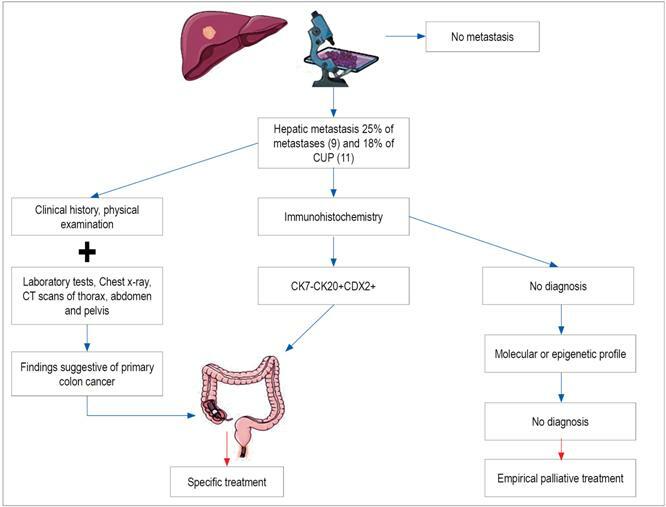 Figure 1 Diagnostic diagram of hepatic metastasis with colon adenocarcinoma profile. CDX2: caudal type homeobox 2; CK: cytokeratin. Figure 2 Diagnostic diagram of ascites in CUP with differentiation of peritoneal papillary serous adenocarcinoma or adenocarcinoma with colon profile. AE1-AE3: acidic and base subfamilies of cytokeratin; HMB-45: human melanoma black 45; S100: multigenic family of non-ubiquitous Ca (2+) - modulated proteins. Modified from: Pavlidis N et al. Lancet. 2012; 379 (9824): 1428-35. The second and third steps for differentiation of carcinomas and adenocarcinomas (1, 25) are shown in Tables 3 and 4, respectively. HepPar1: hepatocyte paraffin 1 antibody; OCT4: octamer-binding transcription factor 4; p63: oncogene belonging to the p53 gene family; pCEA: canalicular polyclonal carcinoembryonic antigen; PGP9.5: protein gene product 9.5; RCC: renal cell carcinoma; TTF1: thyroid transcription factor 1. Modified from: Pavlidis N et al. Lancet. 2012; 379 (9824): 1428-35. 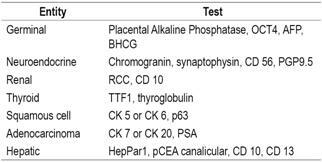 ER: estrogen receptor; GCDFP-15: gross cystic disease fluid protein-15; PAP: prostatic acid phosphatase; TTF-1: thyroid transcription factor 1; WT1: Wilms tumor protein. Modified from: Pavlidis N et al. Lancet. 2012; 379 (9824): 1428-35. Modified from: Conner JR et al. Adv Anat Pathol. 2015; 22 (3): 149-67. On the other hand, favorable subgroups primarily receive regional treatment with surgery, radiation therapy and/or chemotherapy. 1 Survival is similar to that for patients with metastatic tumors of the same origin, 48 and treatments are also similar. Like stage III and IV ovarian cancer, papillary serous peritoneal adenocarcinoma is managed with surgery and chemotherapy based on platinum and paclitaxel. Complete responses are obtained in 30% to 40% of patients, and 70% obtain partial responses with a median survival time of 36 months. Sixteen percent of patients survive long-term. 7,8,25. In tumors with neuroendocrine differentiation, chemotherapy based on platinum, taxanes, 5-fluorouracil or capecitabine, temozolomide or irinotecan is administered, with an average survival of 15 months, with complete responses up to 21% 7 and 13% of patients it presents long-term survival 18. In the case of well-differentiated neuroendocrine carcinomas, survival at 5 years can be> 50% 7. Metastasis with the immune-profile of colon cancer is treated as metastatic colon cancer. Average survival time rangers from 20 to 36 months, the complete response rate is 15%, and the partial response rate is 35%. 25. A metastatic tumor with an unknown primary tumor causes fear in the patient and in the doctor, but this review provides doctors with a guide for the initial approach, subsequent classification, and indications for complementary studies. In addition, it highlights recent scientific advances that focus on new methods of diagnosis and directed treatments.